So is Pure Audio Blu-ray the solution to hi-res music format bafflement? The brave new world of high-resolution audio is a minefield for the unwary traveller, or indeed the under-informed would-be guide. It seems every time an article appears online regarding the future of music at home, first we line up to spot the howlers or information gaps, and then we demand to know why the particular niche of the market to which we cleave has been criminally ignored by the latest hardware arrival or ‘state of the market’ overview. You see, the world of high-resolution audio covers a multitude of formats and definitions: one man’s hi-res is another’s better-than-MP3 CD-quality; for some the ultimate format is 24-bit/192kHz, ignoring the fact that 32-bit/384kHz hardware and recordings are already available; while for others any product not supporting DSD in its various forms is dead in the water. And then there’s the whole problem of stereo vs surround: should we be concentrating on the best two-channel playback we can achieve, or going for what is basically an AV system optimised for audio. If it’s a nightmare for the manufacturer of any new high-resolution equipment: it threatens to be out of date as soon as it’s announced. Or, if you’re lucky, before it’s released – which at least gives you the chance to hold fire, spend times getting things right, and then launch (as happened with the Marantz NA-11S1). And it can be just as bad for the music enthusiast: either you need to keep multiple format-copies of your music, or make sure you have hardware capable of playing everything you manage to throw at it. The latter could be harder than it seems, unless you choose an AV receiver with great care, ensuring it’s able to handle all your stereo and surround recordings; the former may be a simple solution – provided, that is, the labels or sites from which you buy offer multiple download formats for a one-off payment on a ‘buy the best, get the rest thrown in’ basis. Head spinning yet? Already thinking ‘Gawd – no wonder I’m sticking to CDs’? I wouldn’t blame you! However, there is one format designed to avoid these problems, and having been pioneered by Norwegian label 2L – one of my favourite classical music sources – and Munich-based studio msm, it’s now showing signs of being more widely adopted. That format is Pure Audio Blu-ray. On the way at the beginning of December is one of those ‘must-have’ classical recordings – Allegri’s Miserere, by The Tallis Scholars on the Gimell label – as a Pure Audio Blu-ray release. No video, just audio, and the disc offers two versions of the Miserere, complete with its split choral forces and soaring high Cs echoing around the chapel of Merton College, Oxford, and a selection of works by Palestrina, including the Missa Papae Marcelli. On the disc are 5.1-channel surround versions in both DTS-HD Master Audio and Dolby True HD, along with PCM stereo – all at 24-bit/96kHz resolution. And playing them is as simple as bunging the disc into a Blu-ray player, all-in-one Blu-ray AV system or even a computer with a suitable drive, selecting your soundtrack of choice via the on-screen menu, and off you go. Or, if you want to be purist about it, you can do it without a screen involved: the different formats are colour-coded on the back of the Blu-ray case, and you can simply use the colour buttons on your remote to select the one you want to play. Want more? The disc also offers further formats for download to a home computer and playback via network music devices, or the computer itself. 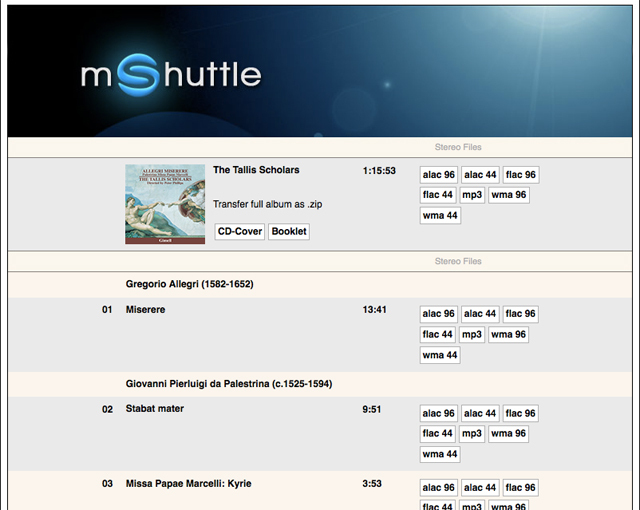 Using the mShuttle system you merely have to key in the IP address of the Blu-ray player in a browser on a computer on the same network, and then a variety of stereo sound formats, along with artwork and booklet, can be downloaded. So that’s just about all the bases covered in one handily packaged format – but why still a disc in the download age? Steve Smith, who has produced all The Tallis Scholars’ hi-res recordings, says ‘The availability of the set on Blu-ray is an important move in making high-resolution and surround sound accessible by more listeners – unlike previous format launches millions of customers already own the equipment needed to play these discs. It’s a persuasive argument to me, but what do you think? I saw the Tallis Scholars perform this programme in Auckland only last month, during the world tour. The Allegri had fascinating spatial effects with one singer at a pulpit to the extreme right of the main group and a few metres above, with a soprano deep at the head of the cathedral. It’s a pity that Gimell only released one SACD, of works by the obscure Guerrero. This blu ray release contains a CD of the same, unlike the current Universal BDAs, so the latter can’t be played on CD players unlike hybrid SACDs. Personally I find the BDA plastic box annoyingly big which precludes filing with my SACDs. Producing CD/BDA dual packs like this and 2L releases is expensive and may restrict the releases to premium prices. It would be more sensible to release BDA with an internet key which gives access to a digital copy, available at various resolutions e.g. for burning onto a CD. The Jonas Kaufmann Wagner recital BDA had this as a high resolution file which I couldn’t use since the latter was restricted to European addresses! What I’m not clear on is if you get the full benefit of the disc if you’re using the stereo analogue outputs of your Blu-ray player? Well, not the full benefit, as of course you don’t get surround when using the stereo outputs. But you can play the 24/96 stereo PCM tracks through these outputs. The uncompressed analog stereo output from the Blu-ray player is considered “lossy” by the record labels because the RCA cables have impedance.. I’ve compared the analog output of my HDACC to the same output on my Oppo, the HDACC sounded better to me and my customers. Using the HDMI output on your Blu-ray player to access the uncompressed HD audio content seems to make a difference, rather than relying on the internal workings of the player to do it. This recording and blu-ray disk sound beautiful, but Occam’s Razor suggests the only really viable path forward for hi-res audio is offering files for digital download and streaming. More and more people are streaming everything in music and movies, fewer and fewer are using set-top players. Blu-Ray is great – I use mine all the time – but it’s just the early 2010s version of the Laser Disc player. Ironically enough, the great hope for hi res audio lies in mp3s. Because the sonic quality of mp3s is noticeably poor enough even to average Joe ears, we’re finally seeing more streaming music customers seeking out at least CD-quality audio. This road will lead a small coterie toward higher res audio, so long as they can get to it without having to buy expensive, soon-to-be-outdated equipment. In an age when CD-quality is barely the gold standard (and CD players are well past their prime), who really believes a HIGHER res set-top player has a future, even if it’s bundled with Blu-Ray? No, the answer for high res audio will be the simplest, most universal one (per Occam’s Razor): Files available for download to the small but slowly growing niche market of people who want the convenience they now enjoy with streaming audio (Sonos, Airplay etc) but are seeking higher quality. Of course it is, Blu-ray’s storage capacity space of 50 gigabytes permits the uncompressed full bandwidth and dynamic range of the original master recording to be presented, bit-for-bit identical. It can only be accessed by HDMI with HDCP protocol, authenticated as secure and protected against piracy. You wont find any Blu-ray soundtracks to download, the studios and record labels protect their copyrights and those of their artists. They don’t care if you copy MP3 files all day long, but not a duplicate of the master recording, for that you have to pay and have the right equipment to follow the new security protocols. The SACD had its chance for glory but the avarice nature of the producers blew its chance. Why should I spend good money on disks that I MUST play on “certified” players, that I cannot load onto my portable MP3 player, that charges a steep premium and in effect only permits me to “rent” the recording and never own? Any SACD I own is a hybrid disk which I purchased for the music; the SACD layer came as baggage. So far as I am concerned the SACD along with the DVD-A deserve their fate. Blu-Ray Audio I believe is an attractive option. What little that has been released offers a variety of playback options on equipment readily available if not currently in the entertainment rooms of many homes. For video the format offers a clear advantage over any of its predecessors. For the premium paid does the format offer an advantage over the CD or an LPCM download? I ask this question since I view surround sound as a gimmick that contributes little to my musical enjoyment. I would have interest only in the 24/96 stereo Blu-Ray Audio option. Blu-Ray Audio may offer a reasonable alternative to the CD. For me the decision will be economic and available music choices. However, the success of the format will depend on the MP3 crowd unplugging their earbuds long enough to listen to music the old fashion way – using a high quality play back system (better yet, live). Otherwise it will become a niche item appealing only to a core group of fanatics. If I were a gambler I’d place my money on the download. It is the only musical source that does not require the purchase of physical media for enjoyment and offers a “de jour” choice in audio formats; suggesting one source to rule them all. With 100 million Blu-ray players now operating in homes around the world, and new live concerts by Peter Gabriel and The Who coming out next month, with pre-orders for each over 1 million copies already, the evidence leads any reasonable person to conclude that Blu-ray is the king of all content now, with uncompressed LPCM 24/192K native fidelity, bit for bit identical to the original master recording. Last Oct, Led Zeppelin’s Celebration Day released, over 3 million sold thus far. For those that believe that high fidelity means “illusion of a live performance”, the Blu-ray provides the actual, real live performance, not just an illusion. You cant download it, you cant record it, but you can watch and listen. Downloads are for people who care more about the cost than the quality and millions of audiophiles are not computer literate, still playing vinyl they hate digital that much. The re-issues of classic catalog hits like Yellow Brick Road, Imagine, Tommy, and others on Blu-ray, we can see the future clearly, Dark Side of the Moon is already out on Blu-ray, the definitive version at last. Challenge your own assumptions, find out the facts, join in and hear what you’ve been missing, either in stereo or surround, both a great.